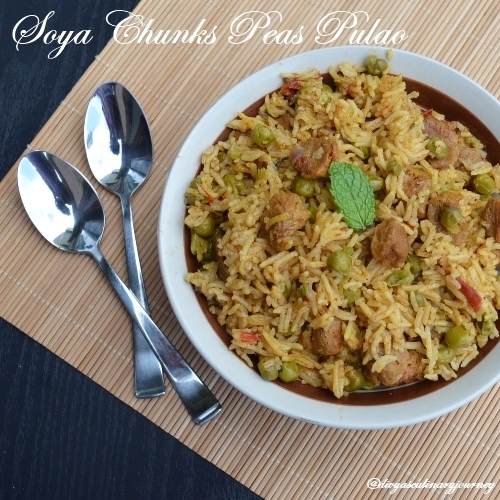 Today's recipe is Soya Chunks Peas Pulao. Its a wholesome one pot meal. Soya chunks are textured vegetable protein. Though they are 100% vegetarian they mimic the texture of meat and also has protein equal to meat. My daughter thinks they are chicken, so whenever I cant cook chicken will make this chunks and she loves it. Cook soya chunks as per the instructions given in its package. Completely drain the water. Squeeze well to remove excess water and set aside. In a pressure cooker, heat oil and add fennel seeds, cinnamon stick, cloves and bay leaf and then add onions and saute till its golden brown. Then add tomatoes, ginger garlic paste, mint leaves and cilantro and cook for 2-3 minutes till they are cooked and soft. Then add turmeric powder, chilli powder and garam masala powder and cook till the raw smell is gone. To this add the soaked rice, prepared soya chunks and peas, also add 4 cups of water and salt to taste and pressure cook till its done. Let the pressure release, then fluff it up and serve with raita. Umm.. Soya pulao.. One of my favorites! That looks really nice. I love Soya Pulao too. Super flavourful pulao, one of my fav combo..
Lovely usage of soy chunks. It can absorb so much of flavor! Lovely combo of pulav and soya chunks. Love it. Very interesting combo of flavours that makes a tempting dish! Looks very tasty & tempting!!! 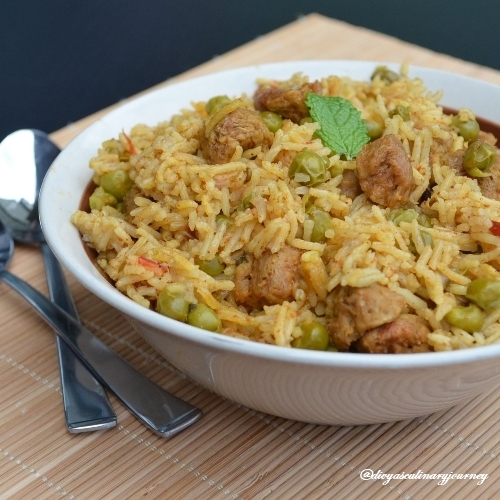 Very nice , yummy one pot dish..
Nice clicks and pulao looks delicious and tempting!